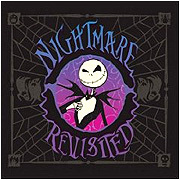 Review: An album released by Disney to commemorate the 15th anniversary of the movie Nightmare Before Christmas, with songs from the original movie covered by modern rock, alternative, and nu-metal artists. Now that you know the formula, I could probably stop right here, and you'd have a pretty good idea of whether this album is for you. But you clicked on a link for a full review, and by God you're getting one. If you've never seen the movie, don't write this album off too quickly. Besides just being a fun listen by itself, it can be a good crash course in Nightmare mythology, without having to sit and watch the movie. If you've seen the movie, but you aren't usually a fan of Korn or The All-American Rejects, you might be surprised at what you find yourself enjoying. Some tracks, like "Making Christmas" by Rise Against, sound awkward at first coming from just one vocalist, instead of an ensemble of monsters. At the same time, other tracks like Marilyn Manson's dark nu-metal rendition of "This Is Halloween" somehow manage to sound more fitting than the original, despite the fact that Manson can't sing worth his own weight in black eyeliner. There's also a few instrumental tracks by slightly more obscure artists, like DeVotchKa, The Yoshida Brothers, and Amiina. These are all either inspired by or remixed from the original score. They're a fun little addition, especially if you have a thing for eccentric instrumentals. So, for the final word, is it an epic symphonic masterpiece? Not really. Does it need to be? Not Really, it's fan service, and a damn good piece of fan service. This will likely be a hit if you have a lot of 90s kids at your next Halloween party. but you might as well download it to get the tiger army digital only song. Yeah, I'll pull out the snob card on this one. A few of the songs on this album have incorrect lyrics. I had downloaded this last year sometime and it began to bother me after a few playthroughs. The one that comes to mind at the moment is the Marilyn Manson cover of "This is Halloween." The lyric "Red and Black and spider green" they sing as "Red and Black and slimy green." That's just the one I can pull off the top of my head, but it happens through more than one song. I thought it bespoke an overall lack of quality in the album. I mean if the arrangers didn't care enough to get the lyrics right, well then damn it. Yeah yeah, nitpickish and snobbish, but I love that soundtrack. Hearing the Hot Topic crew cover it full of errors just didn't do enough for me to want to keep it. And yes, the digital audio songs were the best, imo. I like the movie a great deal, but I was underwhelmed by this album. Hot Topic ruined A Nightmare Before Christmas. Also, this album sucked. Other than Korn's offering, Tiger Army's song is pretty kick.